One of the nice things about the responsibility of ordering cookbooks for my library is that I get to search for recipes cookbooks online on company time (it's like an alcoholic as sommelier, only with less will-power). So I was absolutely thrilled to read in the New York Times that Joan Nathan has a new cookbook coming out in a few months. For those of you who haven't yet heard of her, Joan Nathan is an award-winning author of 10 cookbooks, as well as a guest contributor to the New York Times (food section, of course). She has even had her own television series on PBS! So when it comes to a holiday recipe, I crack open her book or check her website. Or read her latest article in the NY Times. The Times article reprinted several New Year's recipes from her new book, including, the obviously named Rosh Hashana chicken with cinnamon and apples. The monthly farmer's market was conveniently right outside the staff entrance of the building where I work, so there was no excuse not to check out the produce. One of the stands had the most adorable baby eggplants I had ever seen! Since I'm the only one in the family that will eat eggplant, I picked out the two cutest babies. While on line to pay, i noticed the yellow squash beckoning as well, so two additional veggies accompanied me back to my desk. By coincidence, one of the bazillion websites I subscribe to by email (as opposed to the bazillion websites I view via RSS feed) delivered an eggplant recipe. It used the standard ginger and garlic, but I really wanted to make a version similar to the eggplant I get at my local Chinese restaurant, made with hoisin sauce. So I came up with something that was not anywhere near kinda-sorta, but totally delicious (IMHO) anyway. TheHubby likes the local Salad with the Works place, and usually goes there for lunch several times a week. His favorite salad is the Tivoli (yeah, yeah, I know it's not kosher, but ignore this transgression ... Yom Kippur is coming soon). 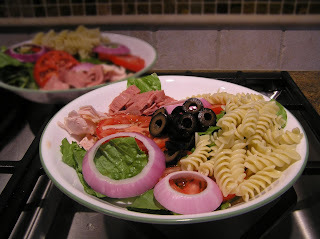 Since I already have in stock the ingredients that usually go in a salad (for a change), I thought I would try to make a more kashrut-friendly version. Did a fast search for an online clone to get an idea of ingredient quantites. Discovered zillions of recipes that call themselves Tivoli, but none that resembles Big Salad Chain Tivoli. The one thing I didn't expect was finding the calorie count for the original Tivoli: over 1,000 calories! Eek! Don't even ask about the number of fat grams. Not sure what the total drops down to when cheese is omitted, but the reduction can't be that much. No wonder theHubby likes it so much!